To learn how to use the Content Editor, click here. To learn how to use Content Blocks, click here. To learn how to use Pods, click here. To add a page to the main menu, in the admin panel, navigate to Content Editor > General Pages. Select the page you would like to add and click Page Properties > Main Menu > Yes. To remove a page, click Main Menu > No. You can edit the phone number in the header under Content Editor > Content Blocks > Phone Number. You can add, edit, and delete photos from the photo gallery under Content Editor > Content Blocks > Homepage Photo Gallery. To add a new slide, click "Add a Content Block > Give it a title and select "Homepage Photo Gallery" as the group. Upload your image and you are good to go! You can add as many or as little images as you'd like. To add content, go to Content Editor > General Pages > Homepage. These are managed under Content Editor > Content Blocks > Homepage Section. Here you can edit the existing Homepage Section Content Blocks or you can click 'Add A New Content' Block and then select the group of 'Homepage Section' to add a brand new one. You can upload a background image, give it a title, icon, link, and width. After you save, it will appear on the website. These products are added to the Homepage through the Product Group 'Featured Products'. After clicking into a product, it can be added under Categories > Product Groups > Featured Products. Don't want to use this? You can remove this section completely by simply removing products from the 'Featured Products' product group. You can edit the text under Content Editor > Pods > Footer Subscribe. Anyone who subscribes to this form will be added to the Contact Type of 'Newsletter'. To delete this section, just delete or make the Footer Subscribe Pod inactive. The pages that show up in the footer are managed in the Content Editor. To add or remove a page from the footer, select the page, click Page Properties, for Footer Menu select Yes or No. To edit the title or to add content underneath the page links navigate to Content Editor > Pods > Footer Left. The business hours section is a pod and can be edited under Content Editor > Pods > Footer Middle Right. The title can be edited under Content Editor > Pods > Footer Right Title. The social media icons available to use are Facebook, Twitter, Instragram, Yelp, Trip Advisor, Youtube, Vimeo, Pinterest, and Tumblr. These are not editable and must be changed by our design team. During the setup process, please send the corresponding links to your project manager. You can add a banner image to a page under Content Editor > Content Blocks. To add a brand new banner, click "Add a Content Block". Just upload your image and select the pages that you would like it to display on. You can delete or edit existing page banners. 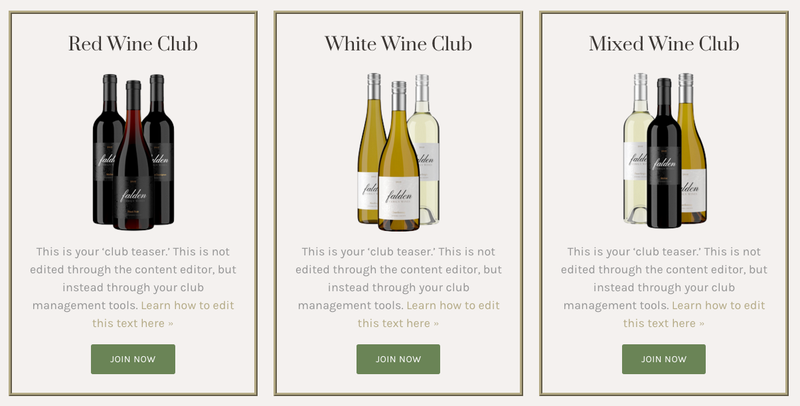 To edit the width of your wine clubs, go to Content Editor > Content Blocks. 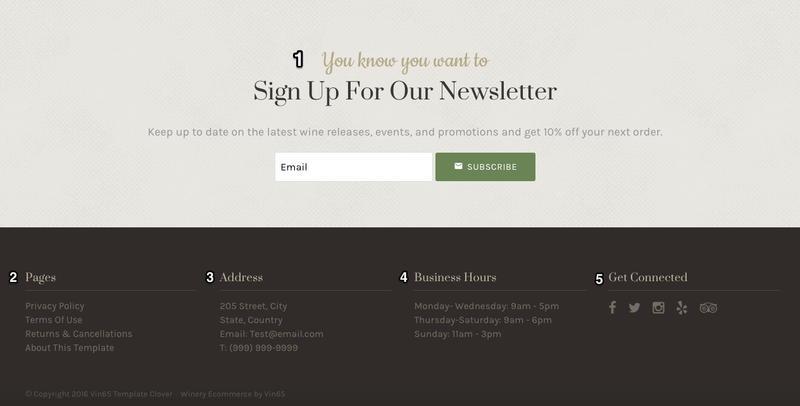 You can edit whether you want your wine clubs to take up the full span of the window, half, or one third.